Le film Frost/Nixon obtient également six nominations aux British Academy of Film and Television Arts Awards 2009 et l'information est reportée sur le site de l'agent Hamilton Hodell. Voir le site officiel des BAFTA Awards. La cérémonie des remises aura lieu le 8 février 2009. La cérémonie sera présentée par Jonathan Ross. Je trouve l'article suivant irrésistible. MG: Hilarious, don't you think? LA: The very word. Marvellous. Terrific. Pant-wetting stuff. Just the job. Only I was wondering if we could have maybe a couple of itsy-witsy, teeny-weeny little changes. MG: Not sure how Jonathan would react to being edited. LA: Not edited, darling, of course not. Never, no, no, no. Free speech and all that. As you know I would literally kill myself to defend someone else's right to say whatever they want. I was fully behind the decision to hire Jonathan. Absolutely appreciate we need to attract young people. And when you reach my age, even Jonathan's a young person. No, I'm just talking about very small tweak-ettes, tiny changeroos, the merest smidge of the cutting room, to make sure we don't offend. MG: What do you have in mind? LA: Well, darling, this opening line: "XXXXX gosh it's great to be here, isn't it?" You see, darling, I'm really not sure about that first word. LA: The first word I'm not actually going to say. LA: Sssh, darling, quiet. I know it's a private conversation, but you can't be too careful these days. But yes, that's the one. In the current climate, do you think he might choose something less fraught than "XXXXX gosh"? MG: I think maybe he is making ironic comment on the Carol Thatcher situation. LA: But this is an audience of actors, sweetie. We don't do irony. Besides, what's wrong with saying it like everyone does, you know, like your man on the street? Something like "Darlings, luvs, how simply divine to see you all"? MG: OK, moving on. I like the joke in the first sentence. LA: You mean: "glad you could find a bus driver who was actually working to drive you all here." Mmm, not sure, darling. Right now, I don't think any of us – and especially lovely little Jonny – can be seen to be making fun of anyone. Least of all the workshy community. MG: It's a reference to the snow. LA: Even more so. Very white, snow, isn't it? What is it Greg Dyke said about the BBC? Hideously white? We don't want anyone to think Bafta is favouring anyone. MG: What about the next bit: "I'm sure you're pretty surprised to see me up here. I'm only a stand in. To be honest with you, the people at Bafta wanted Andrew Sachs. They left a message for him but he never got it. Apparently he's having trouble with his answerphone." LA: What I'm wondering is: do we really want to go back there, raking over old coals? LA: No, I'm talking about when I was looking for an English actor to put on a funny foreign accent for Gandhi and I chose Ben Kingsley rather than dear old Andrew. I'm sure he's still disappointed. Anyhow, let's move on. This bit about Jonathan warning the fire officer to get the water pumps ready for Kate Winslet's speech. Poor, divine Kate: isn't that just a tad cruel? MG: Oh I think she can take it. I thought you'd be more concerned about him saying he wanted to get his hands on her two Golden Globes. LA: Darling, who wouldn't? They're almost as big as an Oscar, you know. No, I'm more worried about him going on about Clint Eastwood's age. MG: What, the reference to him being around so long he can remember when Robertson's was a jar of marmalade not a sacking offence? MG: I think I know what you're getting at. LA: Exactly, darling. Do you have a number to hand for Stephen Fry? I know he's been stuck in a lift all week, but there may still be time to give him a call. L'acteur a assisté à la cérémonie, en compagnie de son épouse, et il a même participé à la remise de prix. Il a été interviewé pour BBC News lors du Tapis rouge et pour la BAFTA à son arrivée au Royal Opera House (voir le clip vidéo ici). 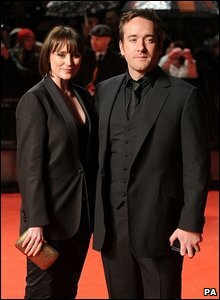 Keeley Hawes and Matthew MacFadyen, in matching black suits, were among those at the Baftas. BrunoPress a publié les trois premières photographies de presse de l'événement. D'autres clichés sont disponibles sur le site d'Isifa, avant de l'être sur celui de GettyImages. Une photographie est également visible dans la galerie "Red Carpet Fashion" sur le site de la BAFTA. J'ai trouvé qu'il n'avait pas l'air extrêmement à l'aise pendant qu'il présentait. J'ai cependant aimé le commentaire de Michael Sheen: "Matthew is an ascetic monk!" D'autres photos sur Corbis, Famous, GettyImages, Isifa, Newscom, WireImage ou WENN (Arrivals, Press Room). Merci Matthieu pour toutes les photos. Cliquer sur la vignette (réservé aux membres).